The initial allocation of pollution permits is an important aspect of emissions trading schemes. We generalize the analysis of Böhringer and Lange (2005, Eur Econ Rev 49(8): 2041–2055) to initial allocation mechanisms that are based on inter-firm relative performance comparisons (including grandfathering and auctions, as well as novel mechanisms). 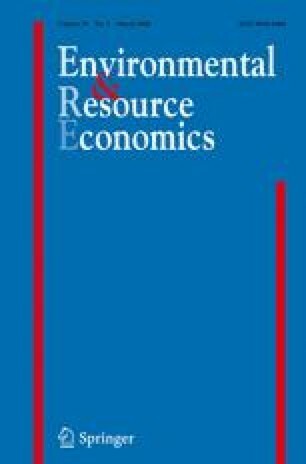 We show that using firms’ historical output for allocating permits is never optimal in a dynamic permit market setting, while using firms’ historical emissions is optimal only in closed trading systems and only for a narrow class of allocation mechanisms. Instead, it is possible to achieve social optimality by allocating permits based only on an external factor, which is independent of output and emissions. We then outline sufficient conditions for a socially optimal relative performance mechanism.